smart and memory card transaction terminal specifically designed for the retail environment. specific loyalty or private schemes. there is an optional pin pad unit which connects to the Pos-Master by means of a coiled cable. The pin pad has its own keyboard and a graphic LCD display. allowing customisation of the Pos-Masters for the countries in which they are to be deployed. 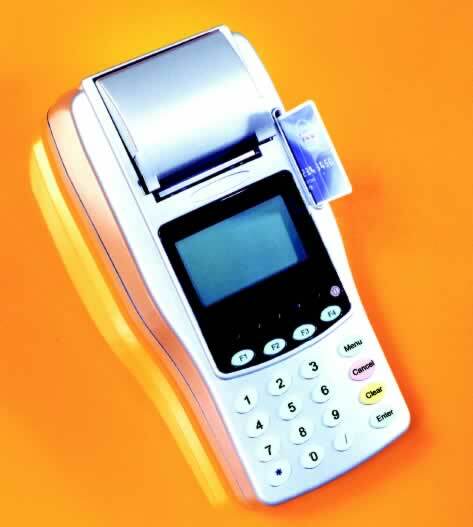 roll mechanism, allows receipt and any other transactions record to be printed at high speed. the addition of optional GSM module. up or NAND Flash memory for uploading to a central site at a later time. Three SIM Modules connectors (option for total of 6). 1 X RS232 serial port with RJ45 connector. Surge protected RxD, TxD, RTS, CTS, DSR, DTR, DCD, Gnd signal. Sealed 5 x AA size Nickel Metal Hydride (NiMH) re-chargeable cells. Pos-Master terminal at manufacturing time. Reader/Writer, Printer, Modem, Magnetic Card reader and Serial ports. PC to the Pos-Master terminal via a RS232 serial link. connector which can be used with JTAG debuggers to give full software debugging capabilities. Limited debugging facilities is available through the serial ports without a need for JTAG. software for remotely supporting Pos-Masters in the field.